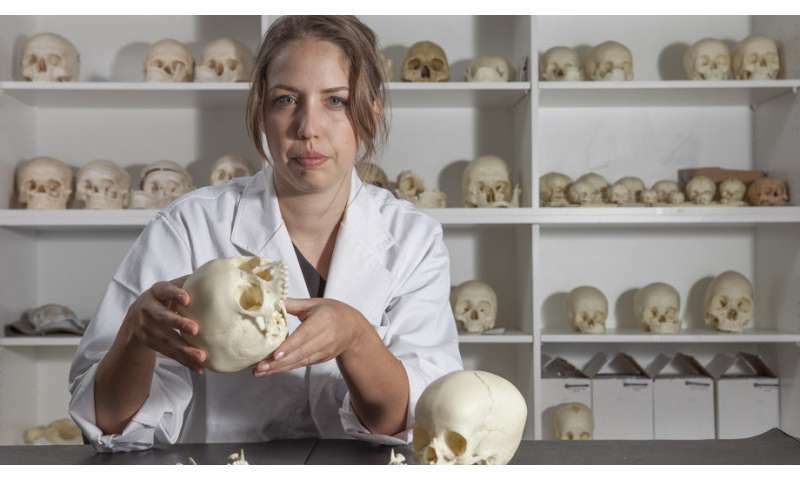 Lead researcher Clare McFadden, a Ph.D. Scholar with the ANU School of Archaeology and Anthropology, said the population trend was consistent across samples taken from 15 locations. "We saw huge population growth associated with the agricultural transition," McFadden said. "Up until about 4,000 years ago you have hunter gatherer type populations, then you have the introduction and intensification of agriculture. "Agricultural transition has been widely studied around the world and we consistently see significant population growth as a result." "For skeletal remains in Europe and America we often see the complete absence of infants and children, they are very poorly represented," she said. "The preservation isn't good—small bones don't preserve well. Children are also thought to often be buried in a different cemetery to adults. "So the method researchers used to measure populations excluded children because they didn't have accurate representation." "In South East Asia and the Pacific, we actually have pretty good preservation of bones from children," she said. "The skeletal evidence was there, we were seeing populations with huge numbers of infants and children compared to the adult populations, which suggests it was a growing population at that time. But the existing tools weren't detecting that growth. "The trends the new tool found aligned perfectly with what researchers expect to see in response to agriculture." HUman beings were planting and eating plants from the beginning: Genesis 1:29. In fact all animals were vegetarian too. The bible has it right and modern paleontologists have it completely wrong. There is no way humans could have existed for 2800000 years prior to now without having discovered how to use agriculture except a few thousand years ago. Plus if they did exist even since about 12k - 28k years as farmers, we should now be overrun with about 50-100 billion people. Where are they? Even allowing for shorter lifespans as per evolution, there should be waaaaaayyyyyyy more people on earth if the evolutionary history is true. The biblical historical narrative is much more consistent with actual observations in contrast to the stupid evolutionary model that has to keep on dodging bullets. Oh, My Goddess! fj's at it again. Desperate to prove that we taxpayers should be demanding refunds from what ever school for failure he wasn't competent to graduate from. But 'cha know what? His little trailer park of ignorant inbreds could make some money off the tourist trade. fj's so determined to revive primitive Sumerian religious beliefs? That his neighbors could make a quick buck off the gullible faithful. Flogging them gimcrack charms, weird idols and fetish schlock. And can do a thriving business in made-in-china magma crap. Oops! Sorry, I meant "caps". Yes I did. "Oh yes! It looks simply adorable on your pinhead." Asian population and its consumption and pollution are ruining the planet. The West is partly to blame, we employ them, like China.